Wright, Jesse H, M.D., Ph.D., Gregory K. Brown, Ph.D, Michael E. Thase, M.D., and Monica Ramirez Basco, Ph.D.
With its unique combination of "reading, seeing, and doing" through lavish use of video, tables and charts, learning exercises, troubleshooting examples, and practical tips for getting the most from treatment interventions, Learning Cognitive-Behavior Therapy: An Illustrated Guide is designed to help both students and practitioners master the core methods of this proven form of psychotherapy. 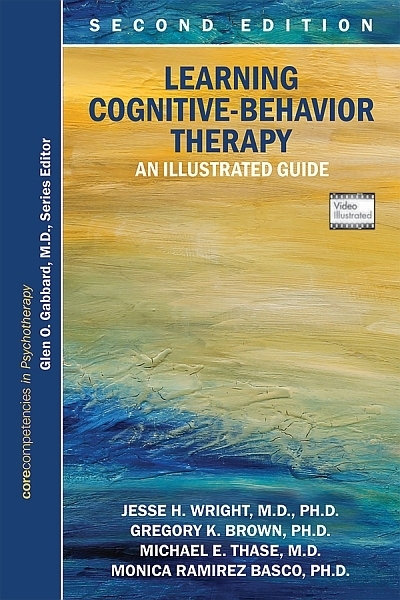 Learning Cognitive-Behavior Therapy: An Illustrated Guide covers all of the key features of CBT, beginning with the origins of the CBT model and an overview of core theories and techniques that guide the work of effective cognitive-behavior therapists. This remarkable volume concludes with two appendices of practical worksheets, checklists, thought records, and other written exercises for clinical practice, and recommended web sites and other CBT learning resources. A DVD is also included. Written by expert cognitive-behavior therapists, Learning Cognitive-Behavior Therapy: An Illustrated Guide is the essential resource for students of medicine, psychiatry, psychology, social work, pastoral counseling, and nursing and for practitioners who wish to learn the invaluable techniques of CBT. Jesse H. Wright, M.D., Ph.D., is Professor and Chief of Adult Psychiatry at the University of Louisville School of Medicine in Louisville, Kentucky. Monica R. Basco, Ph.D., is Associate Director Science Policy, Planning, and Analysis at the National Institutes of Health, Office of Research on Women's Health, Bethesda, Maryland.